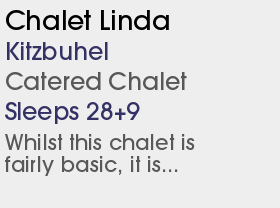 1 Catered Chalet and 5 Half Board Hotels. 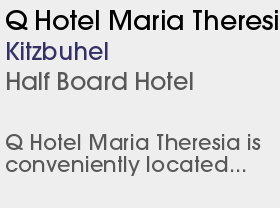 WEsay A truely Tyrolean ambience, this is one of the most beautiful resorts in Austria. 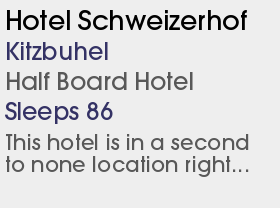 There is a lively apres-ski scene and slopes suitable for all levels of skier and rider. 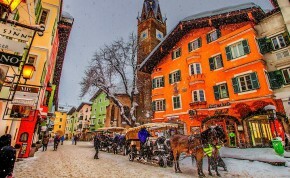 The world famous ski resort of Kitzbuhel really has everything - superb scenery, atmosphere, style and some of the best skiing around, so it's little wonder that Kitzbuhel has been one of the top Austrian ski resorts for so many years. 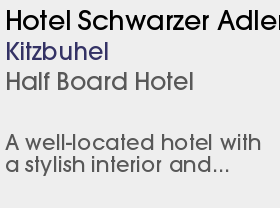 Having recently benefited from a great deal of investment in recent years Kitzbuhel feels revitalised and better than ever. This is a fashionable resort that offers stylish restaurants, sophisticated nightspots and its own casino. The houses are painted in muted pastel colours, a selection of turquoise, sea green, terracotta and yellow. The smart hotels and shops are lined up rather randomly along cobbled streets in a pedestrianised centre contained within the origional walls. Arches divide one street from the next creating a very attractive and pleasing maze to explore. The historic Hahnenkamm downhill, held on the mighty Streif, dominates the resort and tempts skiers from all over the world to take on its exciting challenge. Standing in the starting hut is heart stopping, skiing down is a formidible test of nerve and skill. Some sections look almost vertical, though of corse they aren't. For the less ambitious skier there is a delightful selction of red and blue cruising runs in all directions. The whole area is now linked thanks to the new 3S gondola, opened in 2005, and allows you to ski a variety of nearby resorts and pretty villages. At weekends the nightlife is boisterous. Thers a casino for the high rollers and 60 slot machines for the low rollers. There are dainty tea rooms for families but if you prefer noisy pubs go top the Londoner with live music and lashings of beer. For cocktails on the terrace go to The Drop In Pub, Ecco or Jimmys. In Highways you can drink while sitting in a Cadillac, in a youth-oriented American bar with live music. 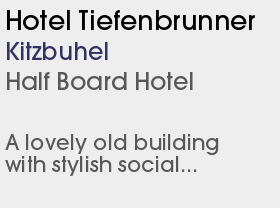 If you want to dance the night away Kitzbuhel has two nightclubs, Olympia and the legendary Take 5. 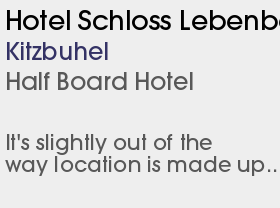 For the non skier there's little that Kitzbuhel doesn't offer. Although the list of activities is predictable it is extensive. Bobsleigh, curling, skating, tobogganing, sleigh rides, horse riding, snowshoeing, hot air ballooning, indoor tennis and then there is the big 'wellness' pool and thermal attraction the Aquarena with two waterslides, sauna, steam, solarium, mudbaths and turkish baths. And if you have any spare time left the town is a treat in itself, with church bells clanging and the smell of sausages and roasted chestnuts in the air. The slow Jufenalm triple chairlift to Steinbergkogel will be replaced by the resort’s seventh 8-seater chair. It will have covers and heated seats and will transport 2,600 people per hour. The new lift will operate closer to the valley station of the Sonnenrast chair to cut out a flat section where poling was sometimes required. Snowmaking will be further improved. Snowmaking was improved, notably on the lower half of Kitzbüheler Horn. A major new lift was added the 8-seat Brunn - on the north-facing slopes between Ehrenbachh and Pengelstein, with new black and red pistes linking to the blue run 27 to the valley at Skirast. And a double chair opened on the minor Bichlalm area, to serve its ungroomed slopes.